I have officially put Kyoto on my short list of very favorite cities in the whole wide world! (She says confidently, having seen, oh perhaps .0001% of the world’s cities….). 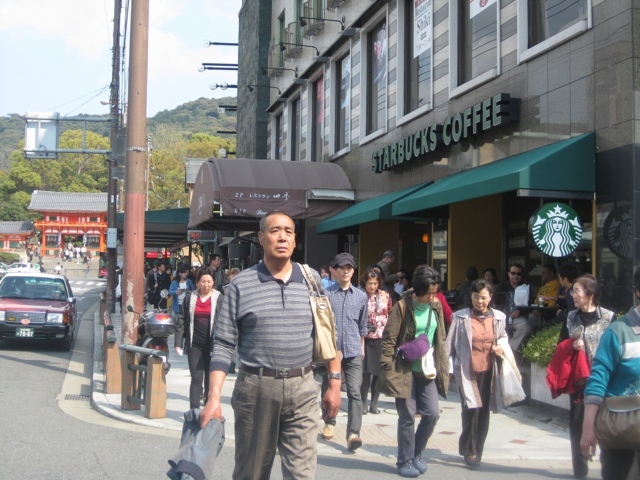 Ignorance notwithstanding, I still can say I love Kyoto more than many, many other places I have been–somehow it nurtures and facilitates my favorite ways of being in the world. 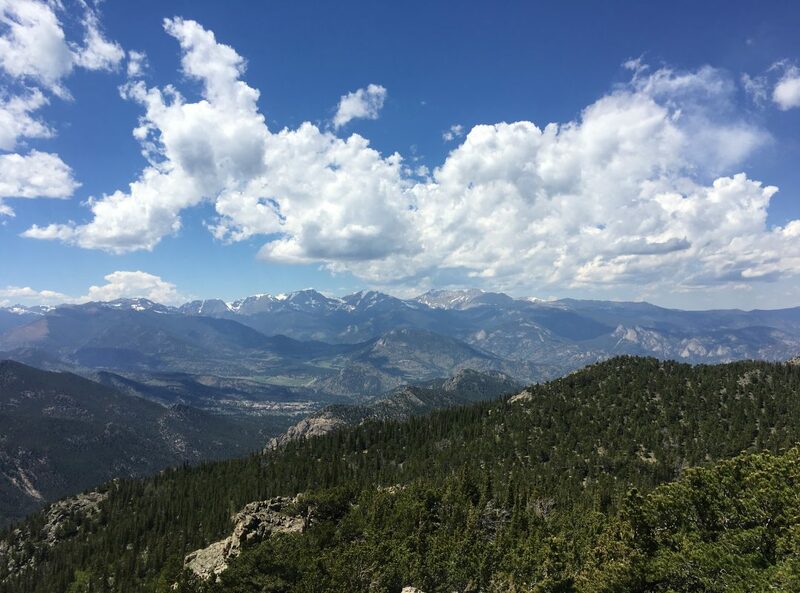 For me, that’s how I describe my favorite places, which–like all of us, I guess–I first recognize with a positive gut reaction and a precognitive, deep affinity. So, I feel most alive, happiest, and most energized in places with lots of green, frequent animal sightings, nice places to run, interesting and walk-able neighborhoods, unique shops, cultural sites, and seasons. Trust me, Kyoto has all that in spades. This afternoon, when I finally just put away my guidebook and started meandering around (Guidebooks are such a dangerous temptation for “Js”–they can function like a straight jacket, as we dutifully try to check off every important site the author says we should see! 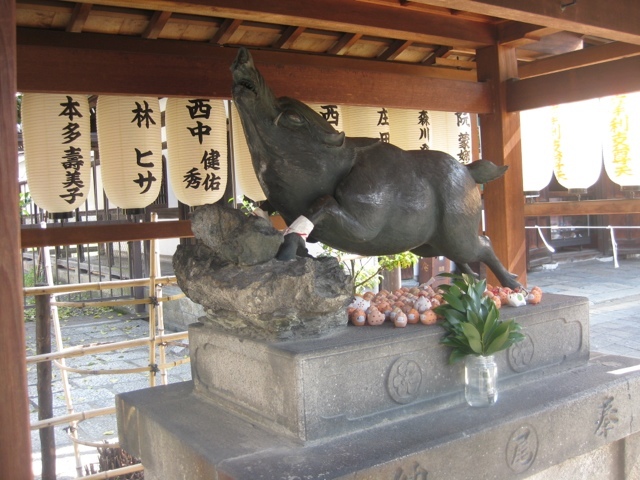 If I hadn’t gone off on my own, I would have missed the little temple that seemed to have the pig as its mascot–no idea what that was about, but I loved it! ), I felt a little like I was in San Francisco (another favorite city)–I wasn’t always sure exactly where I was, but I had a general sense of direction and knew I would eventually find my way. How fun is that?? I started the day with a gorgeous run along the Kamo River–I’ll take pictures tomorrow, but it was fabulous. I saw so many different aquatic birds, including herons, cranes, and egrets. It was a beautiful sunny day today, too–a little windy, though, which at time produced a gentle shower of cherry blossoms. I think I already said that I am catching them just at the end of their bloom: a few more windy days and they will all be gone. I’m not going to detail every single thing I saw today: you know when I say I was walking I mean I was really walking–I covered lots of ground! I’m only hitting the highlights. 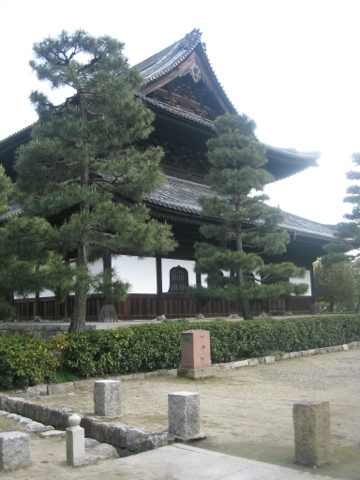 One of my favorite temples I saw today is called Kennin-ji: it is the oldest Zen temple in Kyoto. 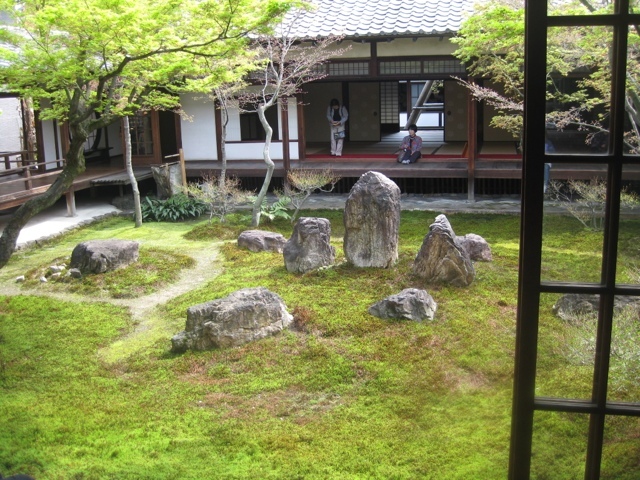 It is in the Rinzai Zen branch, and it was founded in 1202. 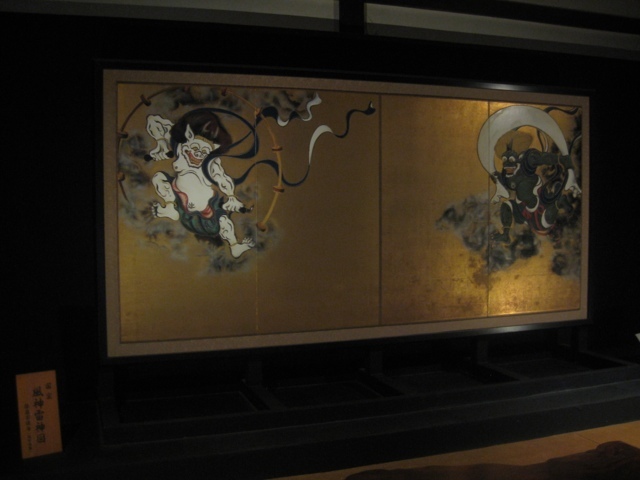 Some of the pictures below are of the screens found in the meditation rooms, the “Cho-on-tei” [“garden of the sound of the tide”]–a Zen garden found behind the main building, the image of the wind and thunder gods, and the twin dragons painted on the roof of the dharma hall. So, temples aside, one of the best parts of my day today was the geisha performance that I saw! 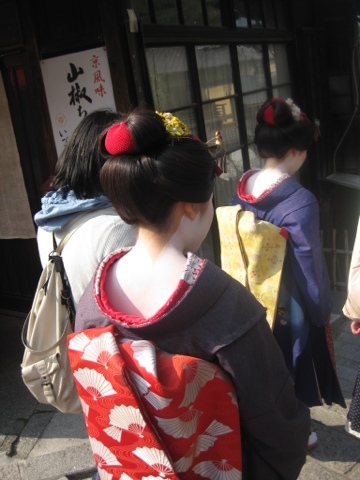 Geishas, of course, have a long history in Japanese culture: they are not prostitutes, of course, but rather highly skilled entertainers, who have spent years perfecting a variety of traditional art forms. [By the way, the book I am currently reading was written by a former geisha who gave up the life to get married. It is very interesting, very revealing!] 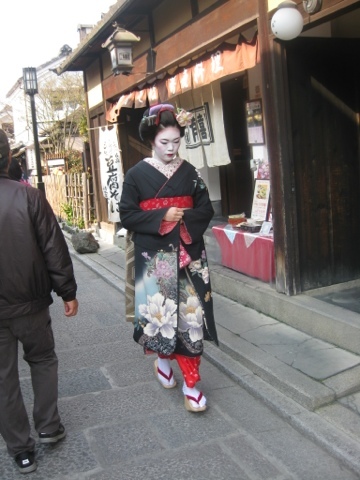 Nowadays, they are less common–my guidebook [published this year] says that it is estimated that there are maybe 100 maiko [apprentice geishas] and just over 100 geiko [a full-fledged geisha] in Kyoto, and hiring them for an evening can be close to $1,000. 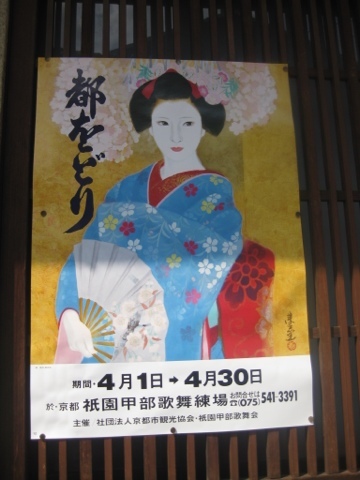 However, luckily, during the month of April, several places sponsor geisha performances–the one I went to today is called the miyako odori. It was amazing! 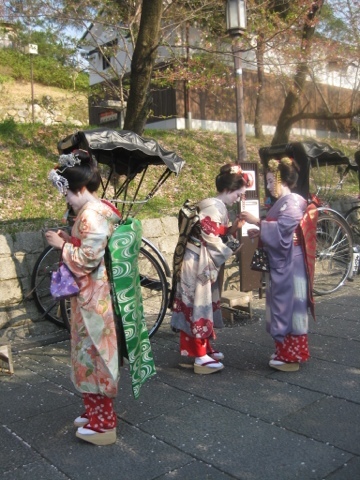 I couldn’t take pictures [so be content with the candid shots of geishas I took while walking around–they actually might just have been tourists dressed up like geishas: normally geishas don’t go out until the evening. In any event, the dress is accurate. ), which was a pity, because the costumes were fabulous. 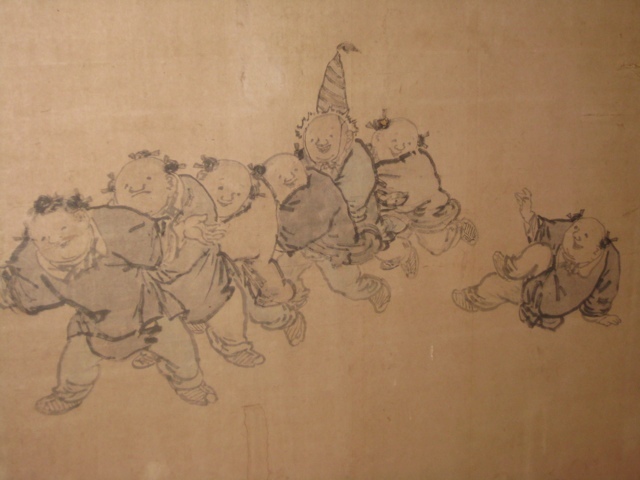 There were 36 different performers, and they performed half a dozen different dances, while 16 other geishas on either side accompanied them with traditional singing and instrumentation–including the shamisen: a kind of three-stringed banjo-like thing that is strummed with a fork-like thing. [Don’t be overwhelmed by the technical language!] Anyway, the sets were beautiful, too–they went through the different seasons, ending with a spectacular cherry-blossom stage, of course. It is a really amazing example of living history, actually embodied in these women. I wondered if they see it as an honor or a prison: they are set apart and greatly admired, but their lives are very strictly circumscribed. 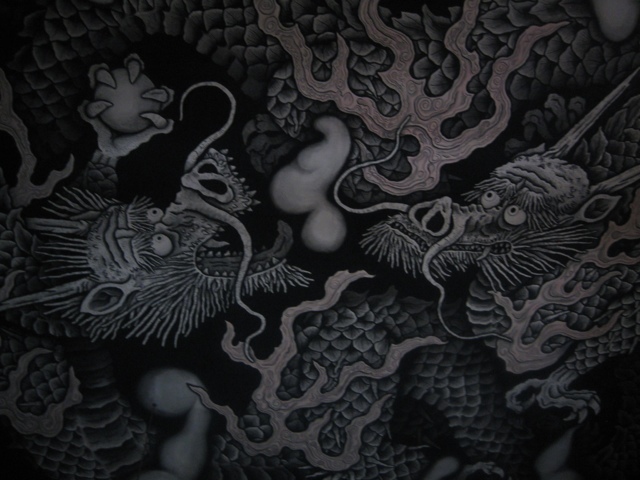 OK–here is my last story to tell. However, before I tell it, those of you who want to read further must promise to keep a secret. Cross your heart? OK–what I am about to tell you, you must never, ever tell my sweet uncle Carl, should you ever be fortunate enough to meet him. Here’s why. 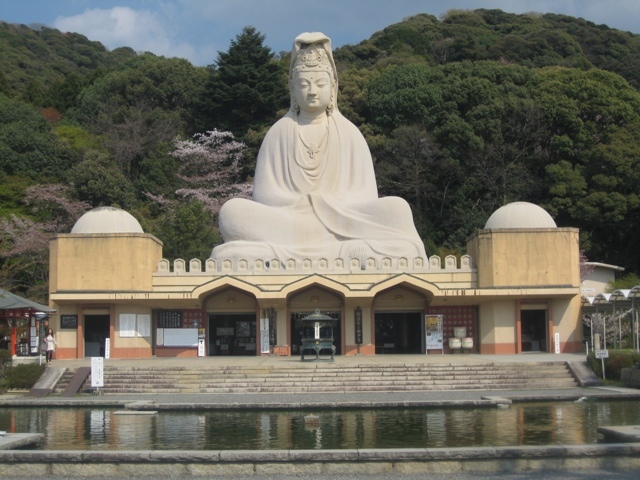 As I was wandering around, I happened to look to my left and I saw this enormous statue of Kannon–and by enormous, I mean towering over the building enormous. 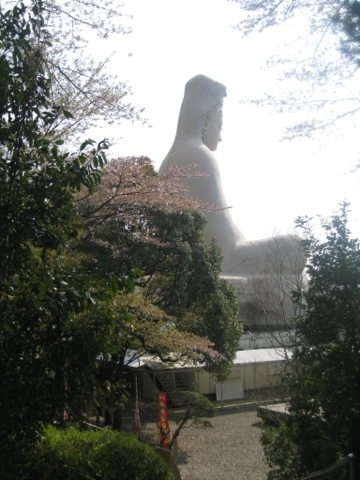 I wanted to get a closer view, and so I went up to pay to get in to the temple–it was only 200 yen, which is pretty cheap, comparatively [$1=70 yen, roughly]. After I handed over my coins, I was handed a brochure and a burning stick of incense–pretty unusual. Normally, there are places in front of the altars where you can buy incense and make an offering with it, but no one just hands it to you on your way in. When I looked down at the brochure, I saw why: it was not only a temple, but a tribute to the Japanese war dead from WWII. Uh oh. If you have read “Unbroken,” you might perhaps understand how my uncle feels about the Japanese side of that war: it’s not like he hates the Japanese people or the nation of Japan as a whole, but the experience of serving in WWII was a crucible moment that has crystalized for him in a way that is unforgettable and unalterable. The man has never owned a Japanese car in his life, and never will–it’s like that. 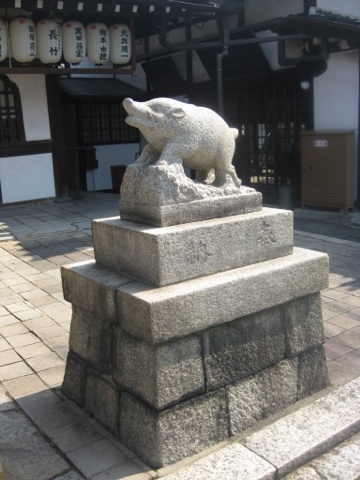 So, even though there was also a memorial to all those allies who lost their lives on Japanese territory, I just don’t think he would understand me offering incense on Japanese soil, in remembrance of Japanese [and other!] soldiers. So, let’s keep this to ourselves, shall we? Finally, note the picture of the Starbucks a mere one block from my hotel. I liked the juxtaposition of the temple on the left, and the Starbucks on the right–I am happy as clam nestled in my hotel between them! Previous: Previous post: Kyoto, Finally!